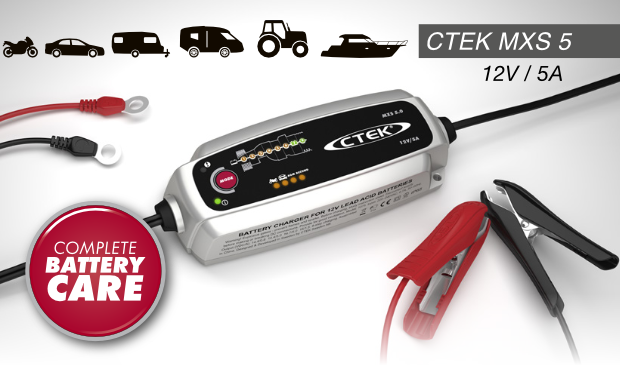 At Groves, we recommend CTEK for your charging needs. We also offer a range of more affordable chargers and all relevant accessories that go with them. The MXS 5.0 comes with automatic temperature compensation for the best charging performance, even in extreme conditions. The MXS 5.0 is an advanced microprocessor controlled battery charger which gives unrivalled performance for lead acid batteries from 1.2-160Ah. It comes with automatic temperature compensation built in which ensures the best charging performance, even in the most extreme conditions. The MXS 5.0 also includes battery diagnosis to establish whether your battery can receive and retain a charge, patented automatic desulphation program, an AGM option which maximises the performance life of most Stop/Start batteries and a special Recond mode for reconditioning deeply discharged batteries. 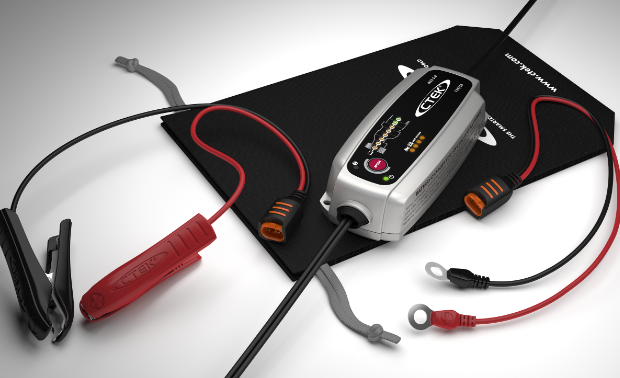 The MXS 5.0 uses CTEK’s patented float/pulse system, which is the most efficient maintenance mode when a battery is connected for long periods. 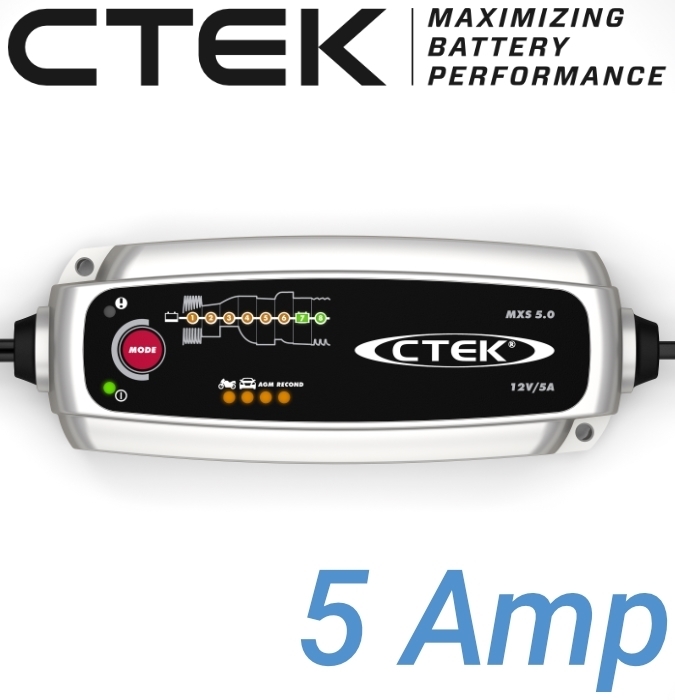 CTEK boasts incredible popularity in the battery aftercare market due to how well their products work. Using their chargers is extremely easy and can provide a 'connect and forget' battery charging solution; we even use them ourselves at our workshop. They are fully automatic which means you can leave them on charge and they will switch themselves off when they are done. When a battery is not in use, we recommend charging once every 3 months or so. The MXS 5 is great for charging all types of batteries. From motorbike to leisure batteries; this charger will charge quickly and can be left to maintain batteries for as long as you like. Perfect if you plan to keep the charger connected for several days / weeks / months. We would recommend this charger for leisure batteries. Temperature compensation: Built in charge voltage temperature compensation according to ambient temperature. Why do batteries need to be charged? With a fully charged battery you don’t have to worry about whether your sports car or motorbike will start after a winter stored away. You have full control and avoid any unpleasant surprises. In addition, the battery remains in top condition, and you can rest assured it will work correctly. Regular charging also prolongs battery lifespan. When should batteries be charged? All batteries self-discharge to some extent, but the amount depends on the temperature. If the battery’s no-load voltage drops to 12.4 V or less for an extended period, sulfation increases, which impairs charging. So it is important to keep the no-load voltage high, even if the battery is not being used. This applies, for example, to batteries for pleasure boats, motorbikes and other vehicles that are only used part of the year. You can do this either by charging the battery at intervals or through continuous maintenance charging.